Stephens Automotive offers five ASE Certified Technicians who will give you a quality auto repair and years of experience. If you are looking for an honest mechanic to do your auto repair near Palatine then look no further, our team is here to help. Don’t let a car repair inconvenience your schedule when you can come in and we will take care of it for you, getting all your car repairs done right the first time. Stephens Automotive provides a car repair estimate that is thorough and reasonable in rate. We are a full-service auto repair, truck, and fleet service center. 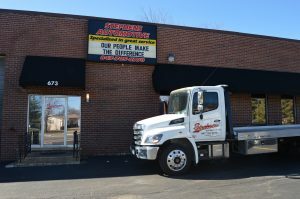 Stephens Automotive is one of the largest auto repair centers in the Chicagoland suburbs. Let our team show you what a great car repair really is. The Chicago suburb of Palatine is a lovely village in Illinois that has a motto that reads, “A Real Home Town.” Palatine has grown over the years and now has over 68,000 residents who enjoy the wooded marshlands and streams that are located around the community. If you need an auto repair near Palatine contact Stephens Automotive to receive a car repair estimate. Visit Stephens Automotive for dedicated service and the best quality parts for an auto repair. If you need a reliable mechanic who operates with integrity on every car repair, then join our thousands of satisfied customers. We value our customers and look to keep you safe with quality car repairs. We are here to service both residential and businesses with any auto repair near Palatine. Stephens Automotive can be reached by calling (847) 705-8770, get your car repair estimate today. Our staff has over 100 years of combined experience when it comes to car repairs.